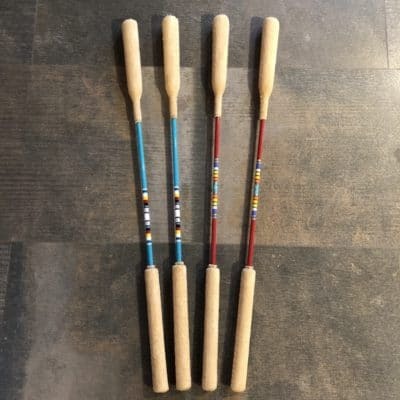 Powwow Drumsticks take a crazy beating and must be made very carefully to survive. 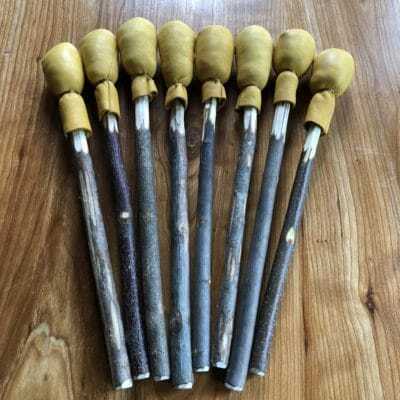 They are extremely labour intensive to produce! 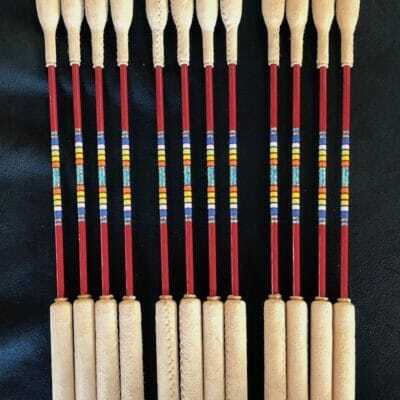 We work with a few local Drum Stick Makers who are truly masters of their art. Our sticks are 23″ long, heads are firm. Our colour supply is constantly changing. We always have several sets in stock and can send you pictures for you to choose from or you can design your own. Custom design orders take about 2 weeks. Please email for available designs: [email protected] OR just mention preferences in comment box upon checkout. 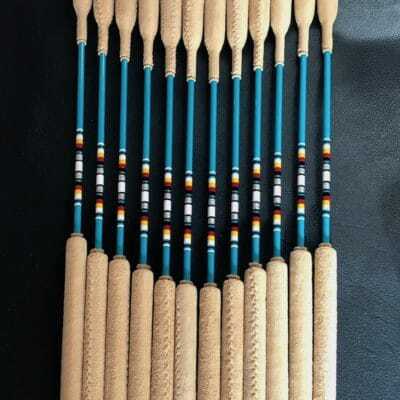 These are the hand drum sticks that we include with all of our larger hand drums (12″ and larger). We make them in house with a maple wood handle, moose leather drum head stuffed with raw sheep’s wool and tied off with sinew. You know that age old community problem of your drum head flying off in the middle of a ceremony / performance… well, we have a secret, and guarantee that our heads will never fly off!! lol They vary in length, but average about 14″ to 15″ long. 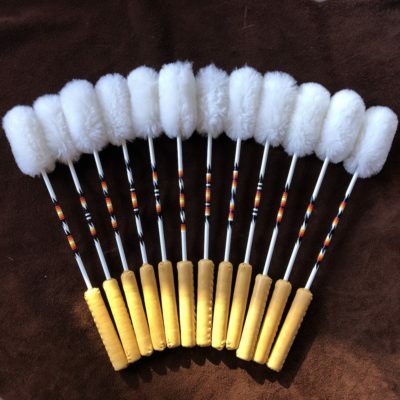 Our Powwow Drumsticks are 22″ long, with leather wrapped heads and handles. If you have custom taping colours, please mention it during checkout in the notes section. Thanks! 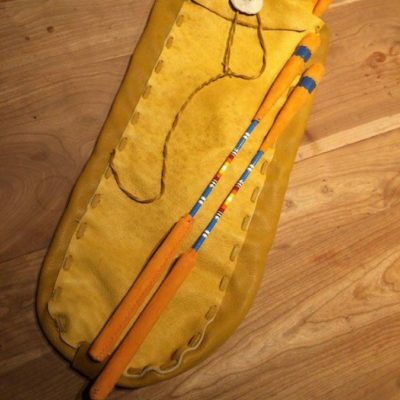 Our Powwow Drumsticks are 22″ long, with leather wrapped heads and handles. If you have custom taping colours, please mention it during checkout in the notes section. These images are examples of what we can make. Thanks!